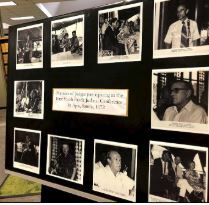 The University of Hawaiʻi School of Law Library recently exhibited items from the Pacific Island Committee Archive. These papers are composed of records from the Judicial Council of the U.S. Ninth Circuit Court, Pacific Islands Committee, which administers the American rule of law in American Samoa, Guam, Commonwealth of Northern Mariana Islands, and the Republic of Marshall Islands. The dates of records and cases in the collection are from 1984-2006. The mission of the Pacific Island Committee is to keep abreast of legal developments and to make suggestions for the improvement of the administration of justice in former and present Pacific territorial areas in which the U.S. Federal Judiciary has continuing responsibilities or interests. These island countries follow a mixture of common and customary laws, while also drawing from U.S. and International laws for guidance. 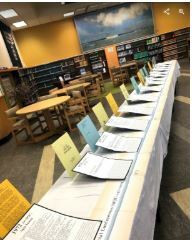 To raise awareness about this collection, the Law Library’s Archives hosted the “Pacific Island Legal Institute Welcome Reception & Exhibit” in collaboration with the Law Schoolʻs January 2019 Pacific Island Legal Institute (PILI). The William S. Richardson School of Law created opportunities to convene jurists from Pacific Island nations to come together for judicial education. The exhibit showcased a series of portraits of participating Judges at the first South Pacific Judicial Conference in 1972. This event was convened by Judges working in various Pacific Islands courts, to engage in dialogue about the future of each island’s judiciary and court systems, after many were under the colonial jurisdictions of Spanish, French, German, British, Japanese and/or American rule. Today, questions of how to balance customary law with the western or imported laws remain. Across the exhibited portraits was a timeline of papers from the Jon Van Dyke and Samuel P. King Collections, showcasing the program booklets of each SPJC from 1972 to 2003. This exhibit showcased the topics discussed at each conference, as well as a quote from that conference. “In the ancient past, our ancestors had frequent contact with each other, but these relations have almost disappeared, and we have become isolated by war and nationalism. Today, we’ve chosen to end this isolation, at least in the judicial field, knowing that the peoples of the world could attain peace and harmony by meeting and exchanging ideas regarding our legal systems…” (Berkley-Coats et al 2009). Archival items from the Jon Van Dyke and Samuel P. King collections elaborated on this quote, providing evidence of various indigenous land tenure systems, traditional resource management, and pre-western relationships amongst diverse Pacific Islanders; the impacts of war and nationalism; and the postcolonial issues that have surfaced since the first SPJC discussions in 1972. The reception and exhibit culminated in a “community testimonies” program, where visiting Judges from American Samoa, Chuuk, Kosrae, Pohnpei, Yap, the Republic of Palau, and the Republic of the Marshall Islands engaged in dialogue with William S. Richardson School of Law Assistant Professor Troy Andrade, and Ulu Lehua Scholars Lydia Fuatagavi (of American Samoa), and Bev Simina and Rockyner Hadley (of Federated States of Micronesia). 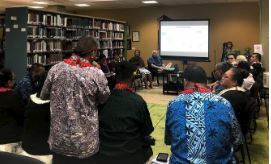 This exchange allowed a Native Hawaiian Professor and his students to ask visiting Judges questions about the laws from their home island nations, such as comparisons of traditional legal systems, and the politics between traditional laws and western laws. In addition, students were able to ask about laws regarding family violence, Native land title and immigration issues on their home lands–subjects they want to learn about as they currently study in Hawaiʻi. The Pacific Island Committee Archival collection can be explored at the law library’s archive website. The featured documents from the Pacific Island Legal Institute Welcome Reception & Exhibit can be found in the digital exhibit. An abbreviated physical exhibit is currently available at the University of Hawaiʻi School of Law Library, Pacific Islands Collection, until the end of January 2019.